Discussion in 'Skins' started by Mitewing, Jan 28, 2012. I was thinking that Dutch from the Predator game would be a good skin, since Contra is partially inspired by the movie. Any thoughts for any other skins? 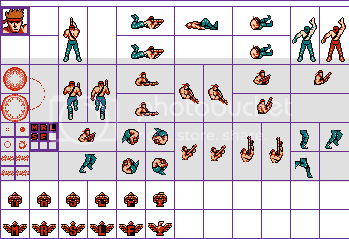 I made Player from the MSX Port of Contra. It's still a bit of a WIP because the Sprite Sheet I found didn't quite have all the sprites. Heck even the powerups weren't included but I did recolor them for now. If yall find anymore rips of sprites from this Game send them to me ASAP because I will update this then. Thank you and stuff. Also the Icon in the Top Left is unused sprite,it MAY be changed. BassWins(YayRandomName), Draken, roman6a and 4 others like this. I made another Bill from the SEQUEL to Contra,Super C. A game not many people remember because the name "Super C" is misleading and dosen't sound too Contra like except for the C. Many people thought Contra Force was the sequel.....weeeeeeeeeeell no it isn't. Long story short,here's the skin. I had to do the Upward,Player Intro,and Pointing Gun Down Sprites because the Sheet I had didn't have em,anyways this is a skin I believe will make it in SMBC because this is a more alt. Bill and stuff,you get the idea,somebody get Ryuza or Jay to take a look here. Mariofan5000, david lindo maldonado, nickreaper and 2 others like this.
. . . Is there any difference besides the color of the pants? Super C Bill plays a bit diffrent. The main difference being the overhead sections and the addition of ramps. Other than that, it's the same thing. I think the flamethrower is different. But gotta admit Super C's soundtrack is awesome. I meant in terms of the sprites, which are all that matter to a skin. I know about Super C and its weapons, but I don't think you'll be able to change those. 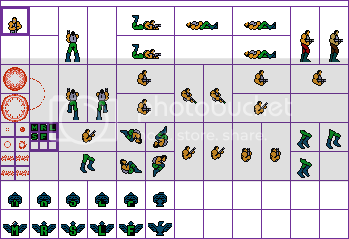 Original sheet from tSR (no credit given on the sheet itself), only the standing sprite (top middle, slightly to the right) is done so far. Really? I thought they were just recolors. Smaller pants could be a skin. EDIT: Also, people should try to find or rip the sprites from the Game Boy Probotector (European version of Operation C). What happens when Mario is told 7 times that his princess is in another castle? So pissed that he becomes...the Plumbinator. One look at the Mario 3 sprite sheet made me realize how awesome it would be for Mario to get fed up hopping on goombas and instead grab Bill's rifle to cause some serious carnage. I created this using a combination of the Bill and Mario 3 sprite sheets. It took me quite a while to sprite edit so hopefully you guys will like it. It seems highly appropriate for a crossover game! Side-note: I realize this is outside the pixel bounds normally required for a skin, but I'm hoping that exceptions can be made! Meg, AGameReviewer, Omicron and 9 others like this. I am uncertain of how to put this in a skin. Can you help me here, Ryuza? I'll have a go at that mugshot though. EDIT: Gave up before I started. K3V1N4000 and Frozsoul like this. I seriously considered changing the power-up items as well before releasing, but I wasn't sure how to incorporate mushroom, fire flower and star into six power-up items (which you seem to have solved the same way I was thinking), and more importantly, I'm not sure how to make these icons recognizable within the flag power-up when they're shrunk to fit only the power-up letter section and have only red and black colors. But I'll certainly give it some more thought. Side-note: I did change the color of the machine gun bullet from red to black, which seemed a nice way to distinguish from Bill. Okay, I originally thought this was just a recolor, but after carefully looking at the sheets side by side for a while, I think maybe Super C Bill actually is a little shorter. Which is good, since currently the top of Bill's head pokes out of a pipe when he enters it, so he could stand to be a little shorter. This could actually replace his current NES sprites.